What makes the Panga design unique is that it is available for anyone to build. The World Bank financed the original design as a project in the 1960s, with the aim of creating a fuel-efficient and safe vessel for third-world countries. It also wanted a versatile and seaworthy boat that was relatively cheap to manufacture in the then new medium of fibreglass. Yamaha embraced the concept in its early stages and formed partnerships with numerous boat builders around the world to construct hulls based on the design. The essence of the design is a shallow-hull skiff with a relatively long waterline. Versions are available from 14ft to 30ft, although 18 to 22ft is the most common. The design allows for fast planing with low horsepower, a feature made possible by a delta shaped planning pad built into the hull. Eddy Slob, owner of Panga Boats NZ, sources his hulls from a Chinese manufacturer, and while true to the Panga design, it has incorporated some improvements. The hulls now contain sealed buoyancy tanks, making them virtually unsinkable, and the deck is self-draining via side scuppers. 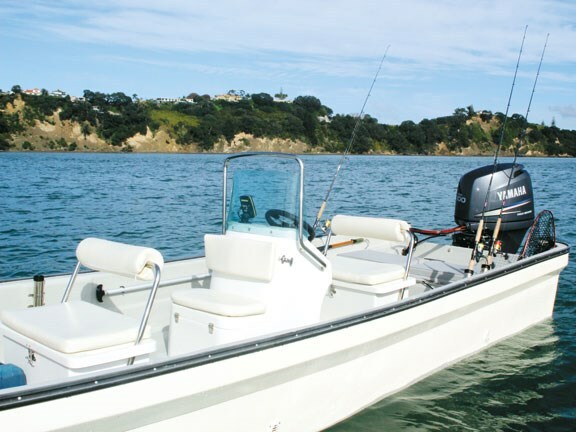 The range has been expanded to appeal more to the recreational fisherman chiefly by the introduction of a gelcoat-finished inner deck moulding and a non-slip deck pattern. The console unit has an upholstered double seat built into the front of it. The helm seat is a double, with a storage locker underneath. A generous windscreen, enclosed by a stainless grab-rail, provides some shelter for the skipper and a passenger. 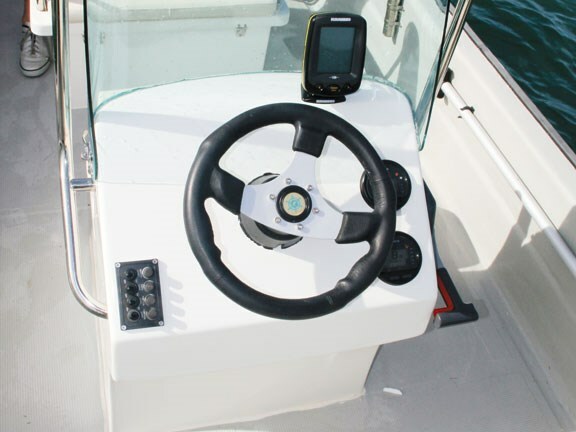 Different console options are available and the flat deck allows flexibility in terms of placement. The dash area is wide enough for a reasonable selection of electronics and the conventional cable steering and manual throttle are quite adequate. A T-top is also available as an option. Forward of the console is another separate padded double seat, complete with a backrest. The seat swings up to reveal a large wet locker. Thanks to a strainer in the drain hole this can be left to fill in order to double as a live-bait tank, or alternatively used as a kill tank. 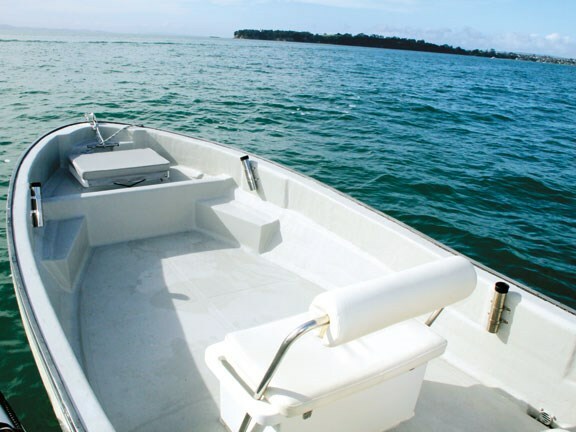 The boat has a huge amount of useable deck space, making it an awesome soft-baiting boat. The gunwales are too low and narrow to sit on, but the seats service a reclining fisherman in some style. In the stern two padded hatches provide more seating while hiding the battery compartment and a separate space for tote tanks. In the bow area another large padded hatch covers the anchor well, and a stainless bollard allows easy deployment of the anchor. The gunwales have no provision for mounting rod-holders internally, so a number of side-mounted rod holders have been fitted around the boat. The ride of the Panga is quite unlike a conventional deep V. There is no perceptible transition as the boat starts to plane, it simply accelerates smoothly. 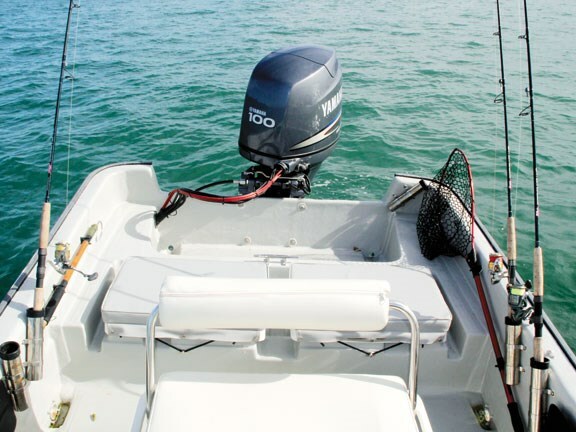 Photos show that under power the bow lifts until the front third of the boat is not even touching the water. Under normal conditions there is very little spray, as the boat is not so much pushing water aside as riding over it. Tight turns produced some heel, but less than a full V hull. Even in a very tight turn there was virtually no spray, while the single strake on either side plus the chine helped grab the water and prevent sideslipping. The boat feels well in control at all times. The 100hp four-stroke fitted was probably excessive and in calm conditions we were unable to keep up in the photo boat. Thanks to the efficiency of the hull this boat would probably perform adequately with a 75hp. We took the boat through some typical Auckland mid-harbour slop, which it handled well, however this is not a boat designed to leap over waves at high speed. In a big sea it would be necessary to throttle back and ride over the waves rather than crashing through them. The stability of the Panga is better than just about any boat I have tested, despite the narrow beam. 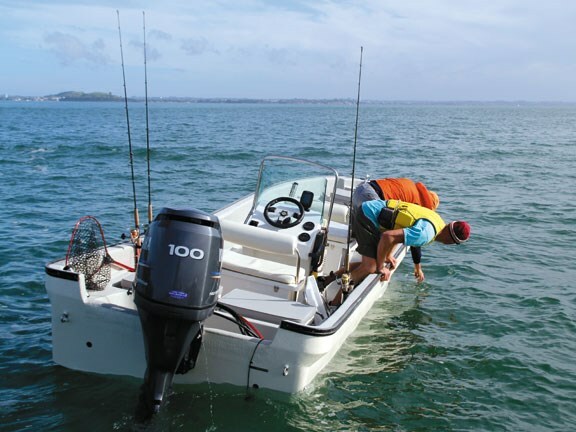 The boat weighs just 520kg, yet the lack of deadrise and its buoyancy right out to the gunwales ensure this boat is never to going to tip over. 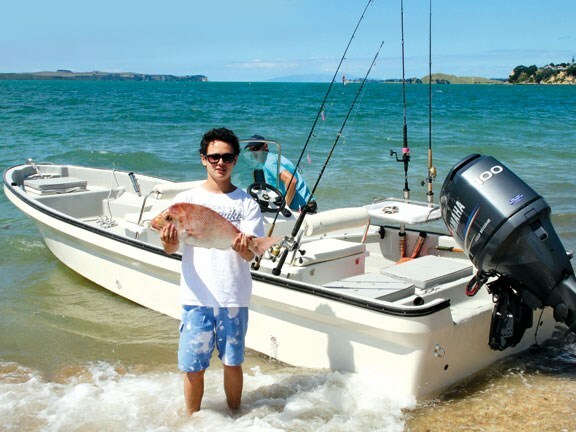 I caught up with Dan Thompson, who purchased an 18ft model powered by a 40hp Sail outboard. Thompson said he had a very modest budget but was still looking for a reasonable size boat that was easy to launch and required minimal maintenance. He says he can easily launch the boat on his own, and regularly runs with three or four people on board. It costs him just a few dollars in fuel for a day’s fishing, and despite the diminutive motor he manages 37km/h with three adults on board. He does not consider himself an expert boatie, but says on the one or two occasions he has been caught out in rough conditions he has always felt safe, simply throttling back to get home. After a day’s fishing he cleans the boat for a couple of minutes with a water blaster. He regards it as absolutely perfect for his preferred fishing style of soft-baiting and has no issues with the quality of its construction or the after-sales support provided by Panga Boats. Another of the Panga’s highly favoured qualities is its ability to run up on the beach. Its flat bottom and low gunwales allow small kids to safely hop off. It is also easy to push back out thanks to the low weight of the hull, and with its flat bottom it does not dig into the sand. This hull makes an extremely good diving tender. The huge deck space easily copes with half a dozen divers’ bulky gear, and there are plenty of places where cylinder racks can be mounted. Entry to the water is easy and it is possible to fit boarding ladders over its sides rather than the stern. We were very impressed with the boat. It represents incredible value for money, both in initial outlay and in operating costs. The boat itself is simple, easy to clean and almost maintenance-free. The ride is good under the right conditions but when there is a large swell the best option is to slow down. 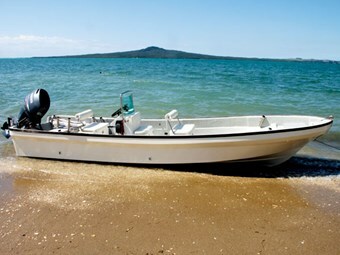 It is a good way for those with a modest budget to get considerably more boat for their money than most other designs. 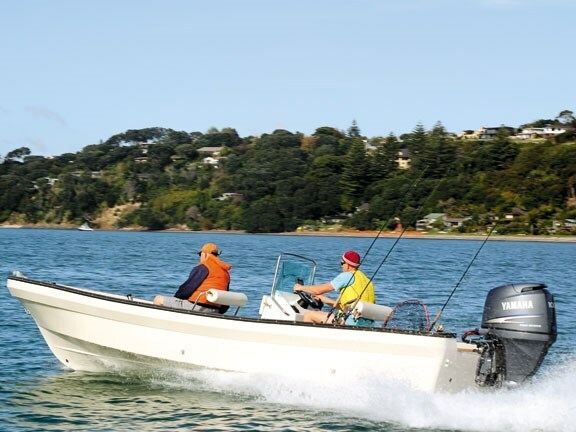 Panga Boats sells directly out of its Auckland base. For more details contact Eddy, ph 021 245 4415.